After a long, cold winter indoors, humans and pets often have the same problem: unwanted pounds that need to be lost for good health and warm weather fun. 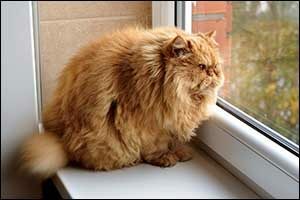 Recent studies reveal that approximately 58 percent of cats in the United States are considered overweight or obese. Unfortunately, just like their human owners, overweight pets are much more likely to experience other health issues, including high blood pressure, heart disease, diabetes, osteoarthritis, joint injuries, and even some types of cancer. Diet and exercise is the best course of action to combat unwanted weight gain. Westport pet owners who want to help their cat to live a long and healthy life should start by scheduling an appointment with their local animal hospital in Dartmouth. Anchor Animal Hospital provides a wide range of services for pet owners in the Southeastern Massachusetts area and also operates as a professional Dartmouth emergency vet for urgent care services. Seasonal pet tips can help to keep your cat healthy and comfortable all year long, preventing many common illnesses, injuries, and situations that can impact your cat’s quality of life. The best way to keep your pet at a healthy weight is not to give them any people food. Consult with your veterinarian at the local animal hospital in Dartmouth to find out the best brand and type of cat food that they should be having and also the amount of food that they should eat in a day. If you provide your cat with treats, speak with your vet about whether or not this is a healthy diet for your pet. While some very active cats might be just fine with a daily treat, others should only have treats offered on a limited basis to help keep them at a healthy weight. Lifestyle can also be an issue for some cats, which is why many tend to gain weight during the winter months when they are less active. Find new ways to keep your pet active year round, including playing with cat toys, getting climbing furniture to encourage an active lifestyle, and interacting with your cat on a daily basis. Frequently check our other seasonal pet tips for even more ways to get your cat up and active through play and other techniques. Make sure your cat isn’t getting into people food or other food items that they should not be eating. If you suspect that your cat might already be overweight, bring them into Anchor Animal Hospital in Dartmouth for a check-up. Fall River, New Bedford, Dartmouth, and Westport pet owners have been bringing their cats into our veterinary clinic for many years. We can provide nutritional, exercise, and lifestyle tips that you can use to help get your cat back to a healthy weight. We can also check your cat to make sure that there aren’t any other health issues that could be contributing to the weight gain, such as diabetes or other common diseases and conditions. Certain metabolic diet foods are available to help your cat lose weight. If there are other health issues or concerns, don’t wait for an appointment – bring your cat into our Dartmouth emergency vet right away. Our team can identify the underlying cause of weight gain or even excessive weight loss issues. Depending on your cat’s condition, we may be able to suggest dietary and other treatment options to help get your pet back on track. Whether you want preventive advice or rehabilitation treatment services, Anchor Animal Hospital can offer a variety of professional veterinary services in Southeastern Massachusetts. Our team of highly trained and experienced veterinary doctors and technicians will provide your pet with quality care and treatment. We believe strongly in ensuring compassion and excellent communication with our clients to ensure a personalized and professional veterinary experience. We use the latest techniques and technology, along with alternative treatment options based on your pet’s needs, to provide unbeatable veterinary, surgical, and preventive services for your pet. Give us a call at 508-996-3731 to schedule an appointment or speak with one of our team members regarding our Dartmouth emergency vet clinic and services.